In my experience, I am often drawn towards collectibles by the source material. What usually happens is: I watch an anime, like it, and decide to get something nice to remember it by. However, there are times when the opposite is true: I see a figure, model or toy that looks so good that I am compelled to check out the source material before ultimately giving in. Yukimura doesn’t seem to know too many words, but he makes good mileage out of the few he does know. The subject of this week’s review – the Revoltech Sanada Yukimura (Limited White Ver.) – belongs to this latter category. Despite having dropped the anime Sengoku Basara, this toy dragged me by the ears to pick it back up again and changed my entire opinion of it. Just before committing to buy this toy along with the Revoltech Date Masamune (to be covered in a future review) however, I conveniently received the duo as presents for my birthday. Well, a good present deserves a good review – and what a good present it is! 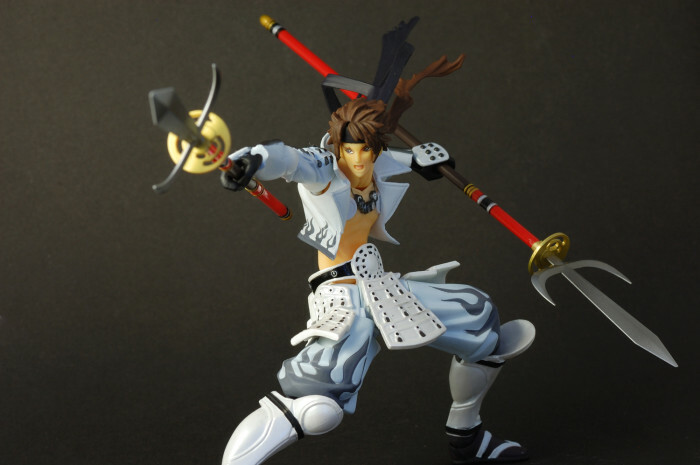 With the exception of one significant flaw, the Revoltech Sanada Yukimura proves that the Yamaguchi Revoltech line is no slouch when it comes to non-mecha figures.